After seeing several nail art designs, I decided to use my current nail polishes to do a similar DIY nail design! 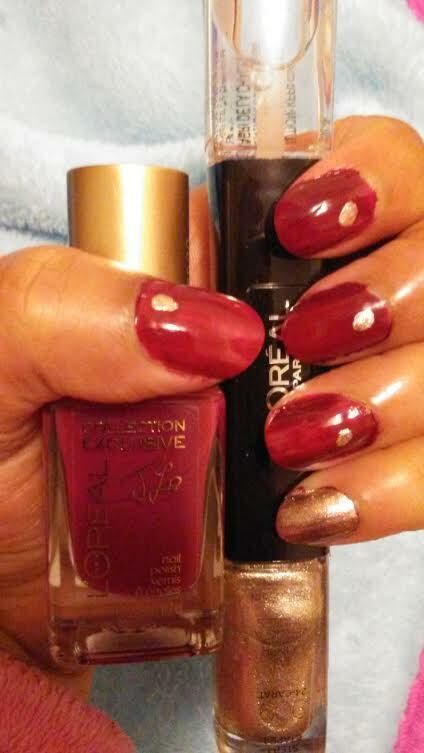 Using Loreal Paris Collection Exclusive nail polish in "Jennifer's Pink" I covered all my nails in this rich red/pink shade and let it dried a little! Next, I used Loreal Paris nail polish in "24-carat" to place a golden drop/circle at the bottom of my nails, let it dry some more! Finally, I used the clear coat polish to cover my nails! !